Polo is a sport which not many people know about. Not many companies in India associate themselves with this sport since it does not get the same attention from Indians as cricket does. It is indeed, a sport of the elite, but it does need promotion and support from the major corporate houses, especially the automobile sector, because one who drives or rides will definitely be interested in this sport of the kings. Now, in order to give this sport a boost in the country, Hyundai has tied-up with the Indian Polo Association to promote the sport and its Sonata brand. 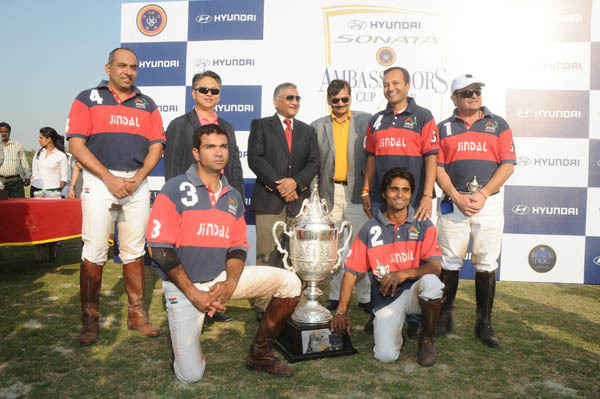 This Monday the Hyundai Sonata Ambassadors Cup came to an end at the Jaipur Polo Ground in the capital. There were five teams other than the Hyundai Sonata team, which competed in the tournament.Other teams included teams likeVayamtech, Black Dog, Hyatt Regency, Jindal Steel and Power and Sahgal Stud/APRC. The four day long tournament between six teams ended with the final showdown on Sunday for the top honors. The chief guest of the final match was General VK Singh, the Chief of Army Staff. The main sponsor Hyundai had its beautiful luxurious sedan Sonata at the venue on display, along with the Verna and luxurious SUV Santa Fe as well as the three-door Veloster and beside them was the not yet officially launched Elantra. The sixth generation of this premium sedan, the new Sonata has some pretty remarkable features both on the inside and the outside. The 2.4 liter GDI petrol engine shells out 198 bhp of power at 6300 rpm while the 25.5 kgm of peak torque at 4250 rpm finally meets the six speed manual or automatic transmission with paddle shifters, depending on what model is chosen. A mileage of 13.5 kmpl comes from the manual transmission model and 12 kmpl comes from the automatic transmission one. It can reach 0-100 in 12 seconds with a top speed of 210 kmph. The power seat adjusts in ten different ways which are coupled with lumbar support.Front passenger seats come with four way power adjust option and paddle shift.The Xenon headlamps are of high intensity, front and rear ventilation, cruise control are few of the other things in the cockpit. When it comes to safety, the EBD (electronic brake force distribution) is coupled with ABS (anti-lock braking system), six airbags to safeguard the passengers and the driver if a collision or accident happens.Push start in the smart key, rear view camera are the things which comes factory fitted. The new Hyundai Sonata is no doubt a premium sedan and is in a class of its own. Hyundai might just be able to transform the Indian automobile industry with this car since this car is highly fuel efficient and has a low emission figure attached to it. The secret is highly pressurized direct injecting fuel into the combustion chamber, whereby it gains the Dual variable timing valve train or VTVT. In future Hyundai will support and sponsor more sports activities across India.